Frosés are among the coolest cocktails you'll have all summer. What is a frosé? 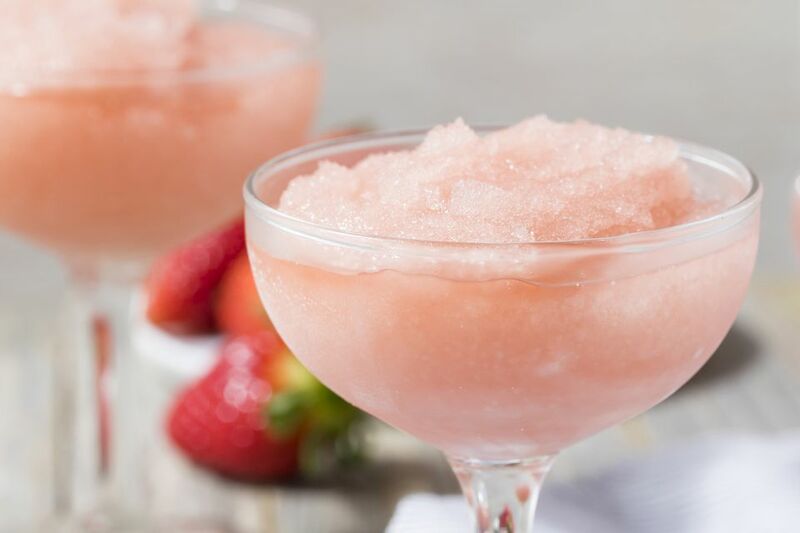 Quite simply, it's a frozen cocktail that features rosé wine and it's a fantastic way to chill out on a hot day. The pomegranate grapefruit frosé is a fun recipe to get you started with this style of drink which has limitless possibilities. The wine is the blush pink delight known as rosé (for Spanish and Italian wines, it's labeled rosado or rosato). Though it's also available as a sparkling wine, you'll want to use the still version for frosés. The style has a light, fruity flavor that can range from sweet to dry. Because you're blending it, almost any bottle of rosé will do for this recipe. The recipe comes from Van Gogh Vodka, so it naturally features their pomegranate-flavored vodka. It pairs perfectly with grapefruit and the two give this frosé a great fruity snap that will have you asking for another round. Pour the liquids into a blender and quickly blend them together. Pour into a chilled cocktail or margarita glass. Garnish with a sprig of mint or thyme and a slice of strawberry. To make two cocktails at one time, simply double the ingredients and blend away. Recipes like the frosé are designed for experimentation, so let your imagination take you new places and explore all the possibilities. You can make it using different flavors of vodka and juice. When doing so, continue to pour 3 ounces of wine and use 2 1/2 ounces total for all the other liquid ingredients. Play around with various fruit vodkas and add complementary juices to your heart's desire. It's difficult to come up with a bad combination and you can spend the entire summer coming up with unique cocktails. For example, Van Gogh Vodka has another recipe for a tasty raspberry frosé. This one pours 1 1/2 ounces raspberry vodka with 1/2 ounce each lemon juice and simple syrup. A very fun idea for any frosé is to freeze the wine in ice cube trays and use the wine cubes instead of clear ice. It's a perfect way to preserve wine that's a little too old for drinking. The alcohol content of wine is low enough so the cubes should freeze up overnight. Not enough wine cubes? Simply make up the difference with regular ice. As with many summer drinks—particularly blended ones—nothing says you can't add fresh fruit to this recipe. Berries, peaches, and melons would all make great additions to any frosé and almost any combination of fruits will work perfectly. Start out with no more than 1/2 cup of fresh fruit and cut larger fruits into 1-inch chunks. Adding volume might mean you'll end up with two drinks from a single blender. If you have too much for your prepared glass, stick the leftover in the freezer until you're ready for another round. Any of the same types of fruit you add fresh or as juice can also be added to your frosé in the form of a liqueur. Melon liqueurs like Midori add flavor and a fun green color. Blue curaçao will add hints of orange and make the drink blue. Strawberry, apricot, and raspberry liqueurs are other great options to try. You can even add a rich background with a shot of amaretto or bring in a floral touch with a liqueur like St. Germain. Yet another way to add a new layer of flavor to your frosé is with a flavored simple syrup. For the pomegranate-grapefruit combo, a nice herbal syrup like lavender or rosemary would be an excellent touch. Mint is a fun idea as well and, if you want to add a little spice, a splash of jalapeno syrup will do just fine. How Strong Is a Pomegranate Grapefruit Frosé? As with most frozen drinks, this frosé is delightfully mild. On average, it should blend up to have an alcohol content around 8 percent ABV (16 proof).